These statements greeted my sixth period students as they entered the room two weeks ago. After everyone was seated, I asked them to reflect on what they saw. Did these statements accurately reflect what was going on in the room? After a brief discussion, I told students that I would make sure that they always knew what the expectation was. If an activity called for them to be silent, we would take ten seconds to practice what that looked like and sounded like. Students who struggled to meet the expectations would meet with me to talk through strategies and work on self-awareness. Not as a punishment, but as a chance to figure out what’s going on and how to work towards improvement. The talk (and a couple of reminders since then) has led to a drastic improvement in the classroom environment. And it’s all thanks to the feedback of three anonymous students. As teachers we’re inundated with feedback. Most of it comes through bureaucratic channels such as checklists, official forms, Likert scales, missives, spreadsheets, and percentages. This sort of feedback can be hit or miss. It’s often tied to faceless initiatives and whatever mandate is big in the edu-sphere at the moment. The feedback that matters most, the kind at the top of this post, can be the hardest to find. What do my students think about what’s going on in our class? Does my instructional style work for them? This type of feedback is built on trust and reciprocity between teacher and student. There’s different ways to collect this kind of data, and each method provides a slightly different take. Meeting with a core group of students over a period of time, a la Chris Emdin’s cogenerative dialogues, helps you tap into how students experience your class on a day to day basis. What lessons worked? What discussions fell flat? Writing back and forth with students and their families in a notebook can provide a comprehensive portrait of how everyone is doing inside and outside of the room. Unfortunately it requires a dizzying amount of labor to pull off on a consistent basis. Luckily there will always be some kids who will just tell you when the lesson sucked. Like most teachers I rely on a combination of these methods. I also like to do a simple “State of the Class” survey. I prefer to use an anonymous Google Form. Here’s a past example if you’re curious. It gives me a snapshot of how kids feel about me, my instruction, and our class. Some of the questions have to do with classroom environment (Do you enjoy English class? Is English class a place where you can focus on learning?) while others focus on instruction (Which of the following activities helped you improve as a writer?) My favorite answers come from the open response questions about how Mr. Anderson can improve. The answers mirror the period. I must admit, I put a couple more questions about classroom environment on my last survey because of sixth period specifically. In this case the feedback confirmed my own perceptions. Going through the survey responses, I often get the feeling that I’m working too hard. That the time I spend massaging fonts and presentation slide syntax probably isn’t worth it. Do I want every unit to be a panoply of epiphanic activities and brilliantly sequenced lessons? Of course! But for a lot of kids, it’s just class. And that’s okay. I’m not going to lie and act like I don’t go home and agonize over every survey that reveals a kid doesn’t absolutely love my class. But it’s a necessary reminder. I also enjoy sharing the data with students. That way if anyone groans about reading, I can remind them that 73% of students asked for more independent reading time. Whether you give a survey, write back and forth, or meet with kids during lunch or after school, the feedback you receive is invaluable. Do kids like your class? Do they feel respected? Do they feel like they’re learning? This sort of feedback cuts through the noise and hierarchies and gets at some of the most important questions to any teacher. The skittering hi-hat from Cardi B’s Bodak Yellow slunk through the classroom. Students bobbed their heads as they composed poems and personal narratives about their names. Period 1’s Class DJ surveyed the class with a smile and returned to his seat, leaving his phone plugged into the class speakers for the duration of independent writing time. Before this year, classroom jobs remained off of my radar. They never interested me. For one, I struggle to delegate work and I have a severe perfectionist streak. I also assumed middle school students would turn up their noses at the quotidian ins and outs of daily classroom life. I was wrong. The more I’m leaning back, the more they’re leaning in. Class Advisory Board members: Meeting with me every Wednesday during lunch to give me feedback on my teaching. What lessons are working, what aren’t, and how I can improve. The first step involved asking the students to figure out what skills each job needed and how each job would benefit the class. I created a one-page description for each job, placed the sheet on a large sheet of butcher paper, and then hung the butcher paper around the room. In groups of 3, students rotated through each job station, spending two minutes jotting down answers on the charts. The idea was to help students think through the ramifications of each class job before applying. Here are the one-pagers I created. Forgive me the old memes. Afterwards, interested students completed a simple Google Form application. They chose the jobs they were interested in and explained why they would be a good fit. At the end of the day I went through and selected students of color who expressed interest. The next day I wrote out “acceptance” letters in fancy font, printed them out on quality cardstock, and signed them with a flourish. In every class I revealed the acceptance letters with as much fanfare as possible. It’s been a week since I passed out the letters. Certain jobs like the book-keepers and TAs were able to start immediately. The griots and DJs, however, have required slightly more attention. Class DJs had to figure out how they would pick songs, if they wanted to take requests, how often they would change their playlists, etc. Griots had to create social media accounts, figure out how to advertise them, determine what they would take pictures of and, as one student kept reminding the group, “find the right aesthetic.” As a result, these two jobs have yet to begin. The decision to go all in with classroom jobs stemmed from Christopher Emdin’s essential For White Folks Who Teach In The Hood. Emdin devotes an entire chapter to discussing the intersections of student responsibility, classroom culture, and equity. He describes classroom jobs as a way to create “…a space where each student is a full citizen responsible for how well the class meets the collective academic, social, and emotional goals” (107). For Emdin, jobs are part of an approach to pedagogy centered on “fostering socioemotional connections in the classroom with the goal of building students’ sense of responsibility to each other and to the learning environment” (105). In a few weeks, I’ll gather together every student with a job so we can reflect. What needs to be changed? What jobs should be added/removed? I’m beginning to see how successfully implementing classroom jobs can shift the culture of a classroom. It’s not easy, and I’m finding that I need to spend more time helping students understand that their jobs are about sharing responsibility, not lording power over one another. I’m confident that as the year progresses, and as I become more skilled at working with students in this new way, we can shift the balance of power and co-construct the community we need. Ever since September, I’ve been meeting with a select group of students to receive feedback on my classroom instruction. Wooed free 7-11 donuts, five students spend every Monday’s lunch period sitting in a circle and telling me what’s working and what could use some improvement. Nap comment aside, the students take the time seriously and view our weekly meetings as important. I was first introduced to the idea of meeting with students to discuss instruction in Ira Shor’s books Empowering Education and When Students Have Power. I loved the idea, but I wasn’t entirely sold. Shor’s books deal mainly with higher education, and I had a hard time visualizing what such a meeting would look like at the middle grades. It wasn’t until I read Christopher Emdin’s For White Folks Who Teach in the Hood that I realized I had to create a space for teacher-student dialogue. For Emdin, these “cogenerative dialogues” are an important and powerful step towards building emancipatory classrooms. The idea is simple. Gather a representative selection of students from your classes. This means students of all ability levels, race, etc. I explained the process and then had interested students fill out a short Google Form. Then, you ask relatively simple questions with easy-to-implement answers. For instance, what are some ways we can do in the opening/closing minutes of class? What are some things I can do more of? Then, depending on everyone’s comfort level and the nature of the class, the questions ramp up. Instruction, discipline, text selection, etc. All topics are fair game. Students then rotate out of the group every six weeks or so. The idea is that students come to see themselves as co-creators of the educational space. The first few weeks were spotty: kids didn’t show up consistently, I struggled with schedules, and discussions were more dead air than authentic exchange. But after a couple of months, we settled into a groove that’s persisted into the new year. The C.A.B., or class advisory board (even after saying it for a month, ‘cogenerative dialogue’ felt forced and weird coming out of my mouth. Instead, I embraced my inner bureaucrat and created a sterile acronym-friendly moniker that fits me), hasn’t yet reached Emdin and Shor’s descriptions. The meetings remain fairly teacher-centered. As soon as the kids come in I pepper them with questions. We make sure everyone speaks, and I move the conversation along at a rapid pace, but my questions and presence drive the meetings. In order to get around that, I ask every class for feedback on the day’s lesson twice a week. This usually takes the form of answering “What worked about today’s lesson? What would you improve?” on a sticky note and plastering it to the wall as they leave. 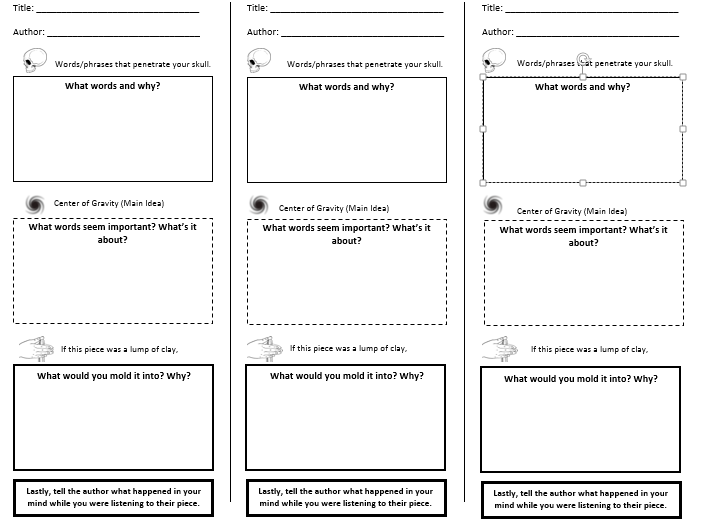 A few weeks ago I posted a graphic organizer I created based upon Peter Elbow’s book Writing Without Teachers. While it wasn’t too bad, it still needed a lot of polishing. This is because helping students take part in writing groups is, in my limited experience at least, one of the most difficult tasks an English teacher can do. I also think it’s one of the most important. Composition truly comes alive when students are allowed to read, share, and respond to each other’s writing. 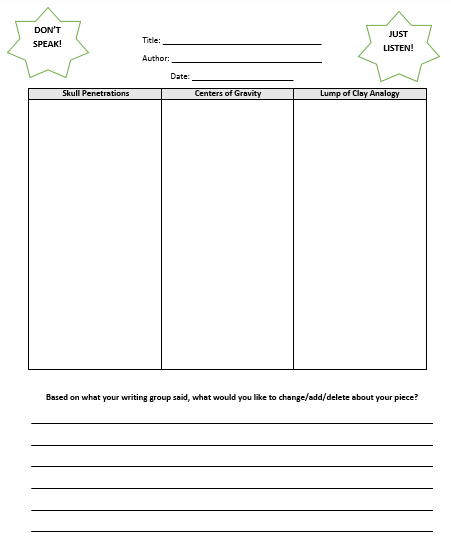 To that end I wanted to share the second version of my writing group graphic organizer. The organizer asks students to respond to writing in four specific ways. Showing: compare the writing to something non-linguistic, the more ‘out there’ the better. This type of metaphorical/analogous thinking is a wonderful way to help students think critically and outside the box. Telling: explain how the words affected you. What were you thinking and feeling during each part of it? I recommend doing this as a whole class before having students go off on their own in writing groups. For instance, photocopy a student’s piece for everyone in the class. Then, after everyone reads it and hears it read to them, go around the room and hear everyone’s skull penetrations. Repeat the process with each of the four response types. Students need to hear each other’s thinking. I love this method because it circumvents students’ tendency to rely on the “I didn’t like X so you should do Y” response patterns learned through schooling. Elbow’s method isn’t about enforcing someone’s vision on someone else. Instead, it helps students understand and articulate their own honest reactions to words. Writing is all about communicating, and this method lets students close the gap between intention and actuality. Link to the document below. *Thanks to Jonathan Lovell for helping me think through revisions to this organizer!